The United States Congress designated the Russian Wilderness (map) in 1984 and it now has a total of 12,521 acres. All of this wilderness is located in California and is managed by the Forest Service. Russian Wilderness sits astride a major ridge dividing the Scott River and Salmon River drainages with steep slopes and broad, U-shaped glacial valleys surrounded by granite peaks. 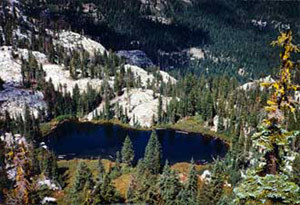 You'll find 22 named lakes, most of them set like jewels in cirques high in the valleys and drained by streams. A diverse array of plants can be found here, including 17 species of conifers--probably more than anywhere else in the world. The forests are laced with meadows, and rocky pinnacles and bluffs rise in numerous locations. Wildlife species include bountiful populations of deer and bears. Elevations range from 4,800 feet to Russian Peak's 8,200 feet. An extensive trail system generally crosses steep and rocky ground, difficult going for stock animals. Stock forage is limited in most of the lakeside campsites. The Pacific Crest Trail (PCT) runs the entire length of the area north-south for about 17 miles, but stays high with few campsites and snow until late in the season. Overall, human use is light. Planning to Visit the Russian Wilderness? How to follow the seven standard Leave No Trace principles differs in different parts of the country (desert vs. Rocky Mountains). Click on any of the principles listed below to learn more about how they apply in the Russian Wilderness.